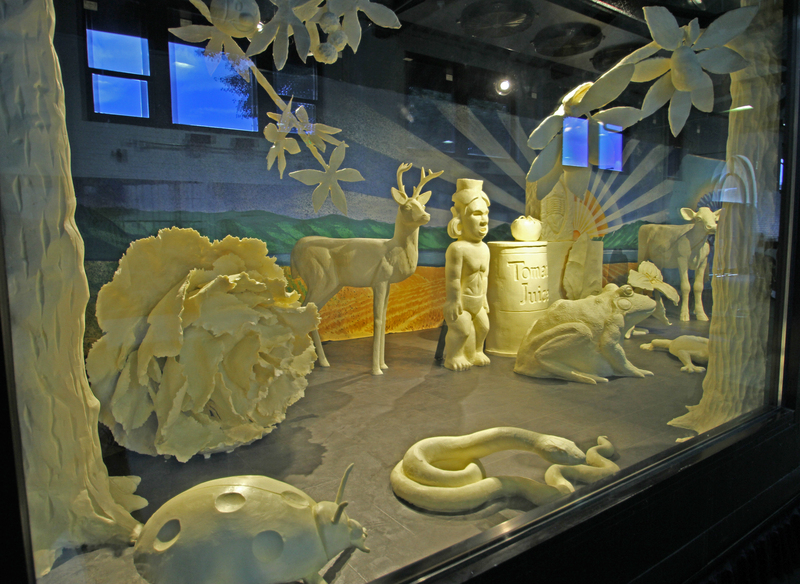 (COLUMBUS, Ohio) Tuesday, July 22, 2014 – The 2014 butter display at the Ohio State Fair in Columbus portrays 15 intricate state symbols that showcase the character and spirit of the Buckeye State. One Ohio icon salutes another as the butter cow and calf share their display case with a collage of carefully-crafted animals, artifacts, flowers and foods that represent the rich history and culture of Ohio. Among the line-up of creamy creations is a trilobite fossil, cardinal, paw paw fruit, spotted salamander, adena pipe and whitetail deer. Every sculpture has a story that sheds light on Ohio’s past and present. The tomato sculpture, for instance, spotlights Ohio as one of the nation’s largest producers of the fruit, and the carnation, the state flower, serves as a tribute to President William McKinley, an Ohio native who always wore a carnation in his lapel. 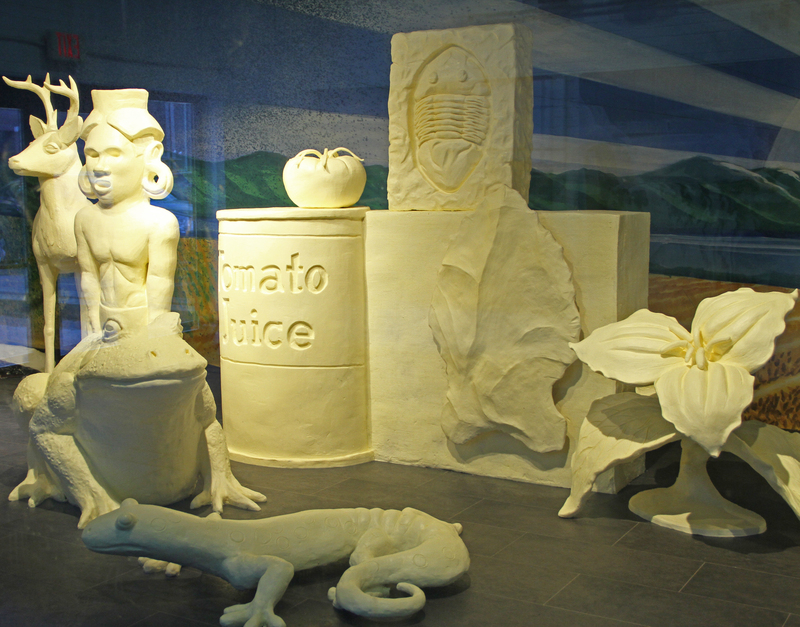 Other butter sculptures, including the bullfrog and whitetail deer are represented in the display because of their prevalence in the state. These animals, along with the ladybug and black racer snake, both known as “friends of farmers” for eating rodents and insects harmful to plants, are found in almost all 88 counties across Ohio. A cardinal also perches proudly on a Buckeye branch in the display, a permanent resident of the state, prestigious for its clear, strong sound and vibrant red coat. This year’s display gives fairgoers a chance to glimpse into Ohio’s past. A detailed trilobite fossil of a now-extinct sea creature which existed in the state 440 million years ago, and flint, a hard rock used by Native Americans to make knives, spear points and arrowheads, share the spotlight with the cow and calf. The mural behind the display is inspired by another state symbol, featuring imagery from the Great Seal of the State of Ohio. The display’s theme, which is always the best kept secret during the planning and sculpting process at the Ohio State Fair, was unveiled today at noon. 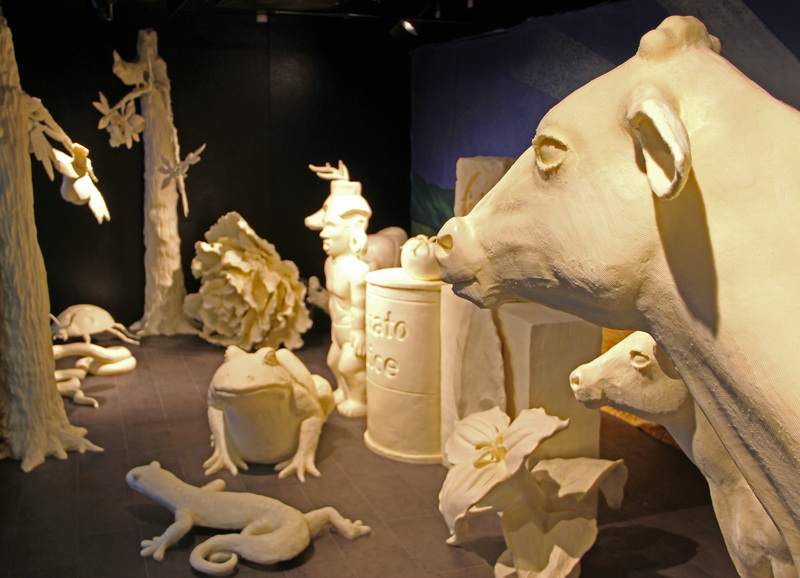 The 2014 butter sculptures share the cooler with the life-size butter cow and calf who are annual favorites. This year’s butter cow and calf are named Scarlet and Grayce, as a result of the butter cow naming contest on Twitter. On behalf of Ohio’s dairy farmers, the American Dairy Association Mideast commissions a group of technical sculptors, several who are engaged primarily in the toy industry, to create the butter masterpiece. This year, two guest sculptors, including a dairy farmer from Shelby County, were enlisted to help with creating the display. 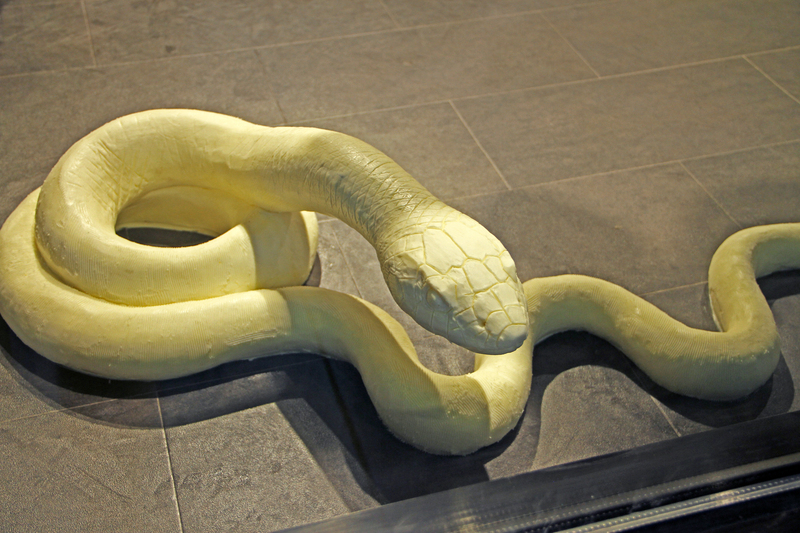 Crafted from approximately 2,033 pounds of butter, donated in part by Dairy Farmers of America, the display was completed in more than 540 hours, which includes approximately 400 hours of actual sculpting. The sculptors began by building wooden and steel frames to support the weight of the butter. From 55-pound blocks, the butter is sliced into manageable loaves and is layered to cover the frames. 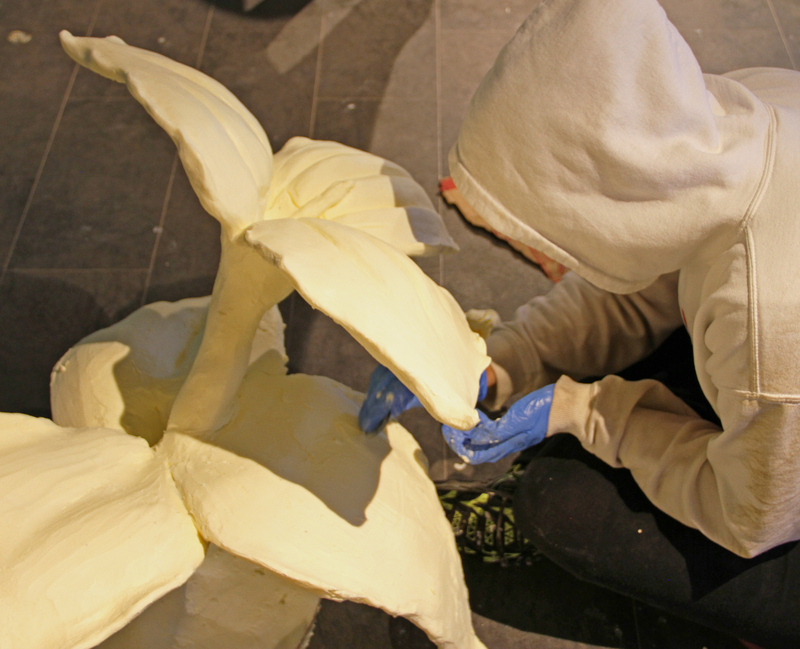 After many hours of molding and smoothing the butter in a 46-degree cooler, each sculpture begins to take shape. Fine details are added last. Each year, the American Dairy Association Mideast selects an icon or theme to feature in butter that is non-political, non-controversial and reflects optimism and broad audience-appeal. The butter display at the Ohio State Fair attracts more than 500,000 visitors each year, reflecting positive ideals and cultural trends in Ohio for more than 50 years. Several of its exhibits gain national media attention with themes that have universal appeal. The butter display is found in the newly updated Dairy Products Building at the Ohio Expo Center, home of the Ohio State Fair. The Dairy Products Building is open daily from 9:00 a.m. to 10:00 p.m. and offers a variety of Ohio-produced dairy foods including ice cream, milkshakes, cheese sandwiches and milk. The butter sculpture display and the Dairy Products Building are sponsored by the American Dairy Association Mideast, Ohio’s dairy-farmer funded marketing and promotion program serving the state’s more than 2,800 dairy farms. The 2014 butter display at the Ohio State Fair in Columbus portrays 15 intricate state symbols that showcase the character and spirit of Ohio. The butter cow and calf share their display case with a collage of carefully-crafted animals, artifacts, flowers and foods that represent the rich history and culture of Ohio. This year`s sculptures share the cooler with the life-size butter cow and calf, annual fair favorites. Every sculpture reflected in the 2014 butter display has a story that sheds light on Ohio`s past and present. The tomato sculpture spotlights Ohio as one of the nation`s largest producers of the fruit, the carnation serves as a tribute to former President William McKinley and the whitetail deer, known as a `friend of farmers,` can be found in almost all 88 counties across Ohio. One Ohio icon salutes another as the butter cow and calf share their display case with a collage of meticulously crafted animals, artifacts, flowers and foods that represent the rich history of Ohio. Among the line-up of creamy creations is a trilobite fossil, cardinal, paw paw fruit, spotted salamander, adena pipe and cardinal. Crafted from approximately 2,033 pounds of butter, donated in part by Dairy Farmers of America, the display was completed in over 540 hours, which includes approximately 400 hours of actual sculpting. 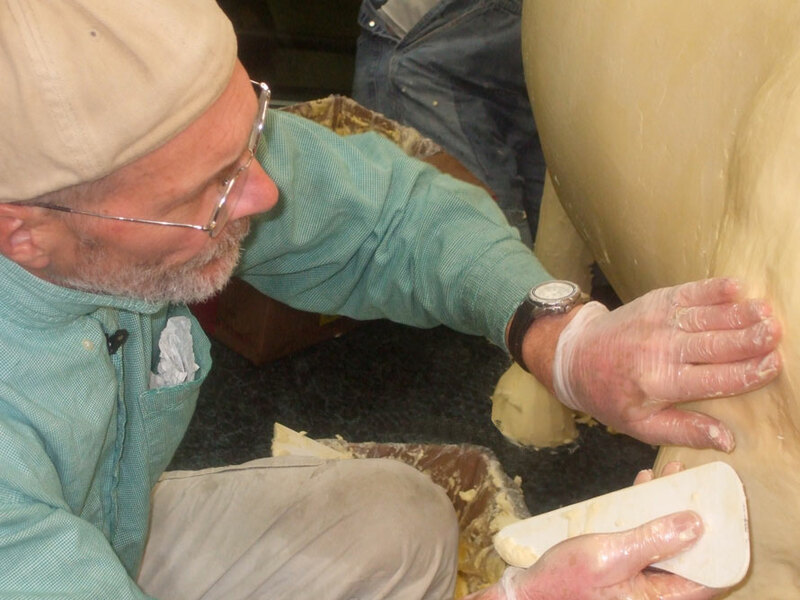 Bob Kling, lead sculptor for the American Dairy Association Mideast`s butter cow, works hundreds of hours each year to plan and sculpt the butter cow and calf. He spends days shaping, molding and sculpting in the 46 degree cooler at the Dairy Products Building, located at the Ohio State Fair. Each year, the American Dairy Association Mideast selects an icon or theme to feature in butter that is non-political, non-controversial and reflects optimism and broad audience-appeal. 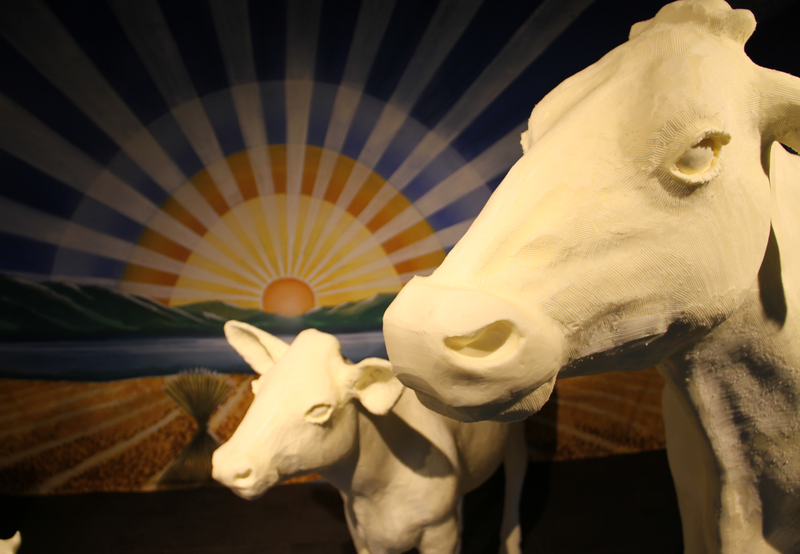 The cow and calf, along with 15 intricate state symbols, can be found in the newly updated Dairy Products Building at the Ohio Expo Center, home of the Ohio State Fair. For the first time in over 15 years, Ohio State Fair fans had the chance to choose a name for the iconic butter cow and calf at the Ohio State Fair. The winner, tagging the cow with the name Scarlet, and the calf Grayce, shared the spotlight with the cow and calf during the sculpture unveiling. The black racer snake, Ohio`s state reptile, is included in this year`s display to reflect the animal`s importance to the state. This creature, along with the bullfrog, whitetail deer and ladybug are found in almost all 88 counties across Ohio. The snake is known as a `friend of farmers` for eating rodents and insects harmful to plants in the region. Among the line-up of creamy concoctions is Ohio`s state insect, the ladybug. The sculptors crafted this sculpture by building wooden and steel frames to support the weight of the butter. 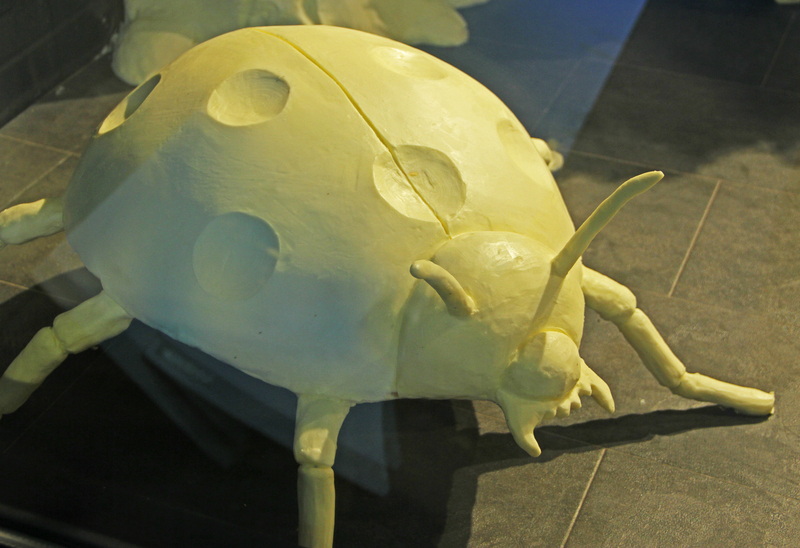 After many hours of molding and smoothing the butter in a 46-degree cooler, the bug began to take shape. On behalf of Ohio`s dairy farmers, the American Dairy Association Mideast commissions a group of technical sculptors, several who are engaged primarily in the toy industry, to create the butter masterpiece. This year, two guest sculptors, including a dairy farmer from Shelby County, were enlisted to help with creating the display. The sculptors created the 2014 butter display by building wooden and steel frames to support the weight of the butter. From 55-pound blocks, the butter is sliced into manageable loaves and is layered to cover the frames. After many hours of molding and smoothing the butter in a 46-degree cooler, each sculpture begins to take shape.